Mark Glanville: Singers are often identified with a particular vocal territory, but you seem happy singing a variety of seemingly incompatible repertoire. How have you achieved this? 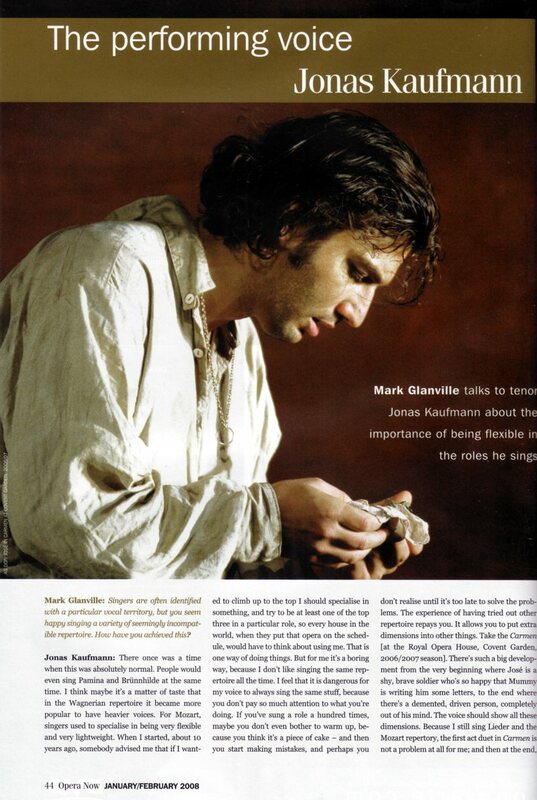 Jonas Kaufmann: There once was a time when this was absolutely normal. People would even sing Pamina and Brünnhilde at the same time. I think maybe it’s a matter of taste that in the Wagnerian repertoire it became more popular to have heavier voices. For Mozart, singers used to specialise in being very flexible and very lightweight. When I started, about 10 years ago, somebody advised me that if I wanted to climb up to the top I should specialise in something, and try to be at least one of the top three in a particular role, so every house in the world, when they put that opera on the schedule, would have to think about using me. That is one way of doing things. But for me it’s a boring way, because I don’t like singing the same repertoire all the time. I feel that it is dangerous for my voice to always sing the same stuff, because you don’t pay so much attention to what you’re doing. If you’ve sung a role a hundred times, maybe you don’t even bother to warm up, because you think it’s a piece of cake — and then you start making mistakes, and perhaps you don’t realise until it’s too late to solve the problems. The experience of having tried out other repertoire repays you. It allows you to put extra dimensions into other things. Take the Carmen [at the Royal Opera House, Covent Garden, 2006/2007 season]. There’s such a big development from the very beginning where José is a shy, brave soldier who’s so happy that Mummy is writing him some letters, to the end where there’s a demented, driven person, completely out of his mind. The voice should show all these dimensions. Because I still sing Lieder and the Mozart repertory, the first act duet in Carmen is not a problem at all for me; and then at the end, I use my experiences from the German repertoire — Parsifal, Meistersinger, Freischütz, Fidelio, things like that, so the fourth act is nothing. Well, perhaps not nothing, but I know how to handle it! MG: Did you have a very natural singing voice? JK: The goal is to make it sound very natural, but it’s a long path. One of the main secrets is to discover the ‘sound’ of your voice. Everybody has their own sound because of their physiognomy. When you study, you try to imitate people that you admire, that you think are right for you. In my case they expected the voice of a young, typical German tenor, so they really forced me to sound like a Peter Schreier. He made that sound to perfection. I manipulated my voice so much, to make it sound that lightweight, that flexible. But after the first year of my ‘Fest’ contract I really had problems. I realised that I had no idea how to sustain the voice every day several hours, six days a week. It ended in a catastrophe. I said, ‘If this is singing, then I have to do something else, because I’m really suffering, keeping my fingers crossed every time I go on stage that it will work, and the voice will sustain. Finally I went to an American baritone, Michael Rhodes. He had studied in New York and heard all the great singers in the States. He made me sing every vowel with an open mouth, including an ‘ee’, in more or less the same position. That relaxes the voice box. It took a while. And then he said, ‘Sing with your own voice,’ and I said, ‘Well, every time I do that for real — as opposed to in the bathroom or the elevator — people say, “No, no, don’t do that! It’s absolutely wrong!”’ But he said, ‘No, this is your voice. Just let it out.’ Even if it sounded a little bit crude and weird at first, eventually I was able to sing for eight hours a day, and wake up the next morning and the voice was fresh. Before that I had had lessons with teachers where I couldn’t sustain three quarters of an hour and I came out being unable to talk. And still I went back and tried it again. So when I finally had that experience, I thought, ‘Wow! My voice is still there. MG: You have a wide range of characters that you sing. Are you finding things within yourself when you‘re playing these characters, or are you basically using your imagination to find out what these people might be like? JK: Hopefully, it’s a mixture of both. For me, performing on the stage is like being paid to do therapy. You can live out the darkest sides of yourself. It’s not that I have a murderous side, but if you search long enough you will find a way to combine your own character with a murderous person. Then again, you shouldn’t go too far! I know people who come out of the theatre and can’t leave the character behind. Hours and hours later they are still that personality, and that is a little bit odd. But I try as much as possible to feel as if I could be this person. For me that’s the only way to make it as credible as possible. Of course there is ‘acting’. When you have a long opera, four or five hours sometimes, you won’t sustain the whole time. There are certain moments when you turn off for a couple of seconds. Then, of course, you have to ‘act’ to cover that. Experience on stage is the most important thing. To control deep inside, not to go over the top, to always keep within your limits. Always keep in mind that you’re going to have to do it again, and it’s not going to be the last role of your life. Of course, you are testing your limits sometimes. In the Carmen last year, the fourth act was extremely violent, the real thing. We were really fighting hard, and people were sitting on the edge of their seats thinking, ‘Are they crazy? Is it supposed to be like that?’ We were panting for breath, and then we had to sing those last long, smooth phrases completely exhausted. If you’re playing a character who’s deeply depressed and crying, and has to be out of breath because everybody’s seen him run up and down those steps so many times, why should he sing without it having any effect on his voice? It’s not real. You have to hear his weakness, in the voice too. So I don’t care if sometimes it’s not the perfect CD sound, because in the context of being on stage and at that moment in the story, it’s the perfect one. When you have to do physical things, like run while you’re singing, you’re not using the air to breathe, only to produce the sound. So if your body says, ‘Breathe,’ and the phrase is not over, you can’t. But you have to. In this production it felt as if it was the split second before fainting. It’s interesting to find out your limits. Then you think of what you have to do to not end up there again, to find the perfect balance, to do everything as you would like to till the very end without collapsing. MG: When you‘re learning a role do you find the character first and foremost through the voice and music? JK: Of course, the music shows you a certain direction, which you can’t ignore. With Monteverdi, it’s up to you to build a character. Even the orchestra at that time could decide how it should sound. There are so many variations open to you. There is much more opportunity than with, say, verismo, where there is just one line that you can follow. But I’m thinking about the characters all the time, trying to discover their weaknesses, their different sides, to add something, if they have a special tic something you can see. In Carmen I wanted the audience to think from the very beginning that this José is not the handsome, nice guy he seems to be. I tried to explode from one second to the other, and people said, ‘What was that? !’ It’s not written in the music, not at all, but I read the Merimée novel to discover more about this character. Then you do it again and you discover something new, and think: why don’t I try this, within the limits of the production? That’s another reason why I try to avoid singing the same part many times in a row, because it’s very easy to fall back into the same routine. If the director leaves you alone and lets you do your own thing, what do you do? You fall back into the things you’ve done before and you’re not trying to discover something new — Another costume, but it’s more or less the same.